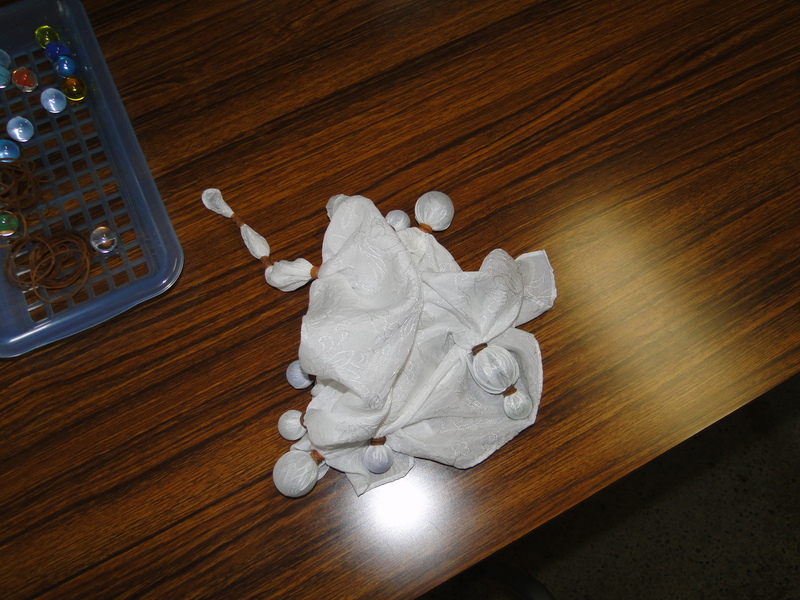 The beginning of all sweaters – yarn snot. 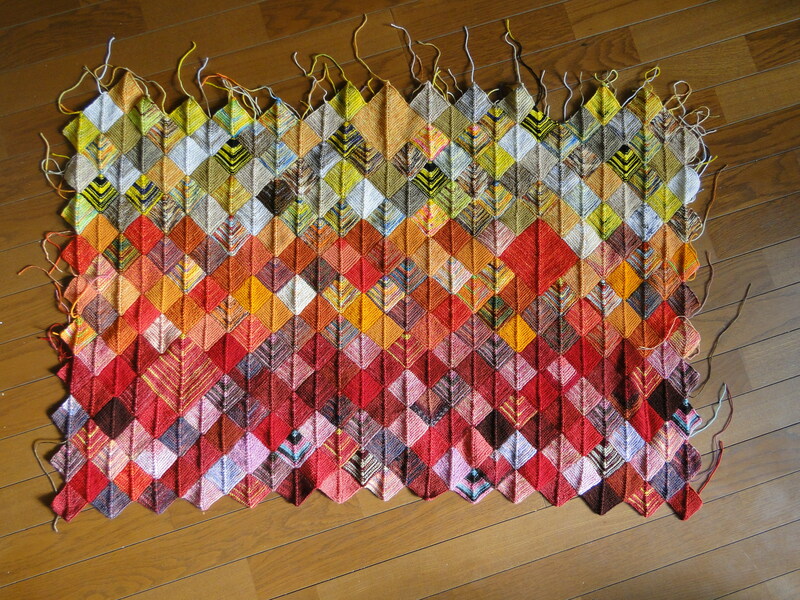 Last week I posted about being inspired for a knitting project by a book called ‘Japanese in Ten Minutes a Day’. Those kind of books always drove me nuts back in the day. I mean even now, more than ten years after I started studying Japanese, I still study at least 30 minutes a day just to keep my skills up and to learn new vocabulary. Sometimes it’s more like two hours, when I’m studying for the JLPT (just passed N2, whoot!) or the Kanji Kentei. Ten minutes? Not going to cut it, especially if you want to live here. Despite that, it was that book that I was thinking of last week when I was overcome with the urge to start a sweater. As you may have noticed, my knitting blog posts have been a tad single-minded recently – blanket, slightly larger blanket, even slightly larger than that blanket. That’s not my usual MO. I much prefer to have multiple large projects on the go, along with a couple of smaller, more portable ones. Unfortunately, work limits my time to the point that all of my knitting time has to go to the blanket to finish it before March 31st. But I really needed a break. And I haven’t knit a sweater in two years (gah). So I worked it out – there were fifteen minutes a day that I couldn’t knit on the blanket anyway: when I’m giving my daily sacrifice to the stationary bike. I tried working on the blanket while chugging away, but now that it’s half done it was much too cumbersome. So. A sweater. In fifteen minutes a day. What you see above is 2.5 hours of work, over ten days. 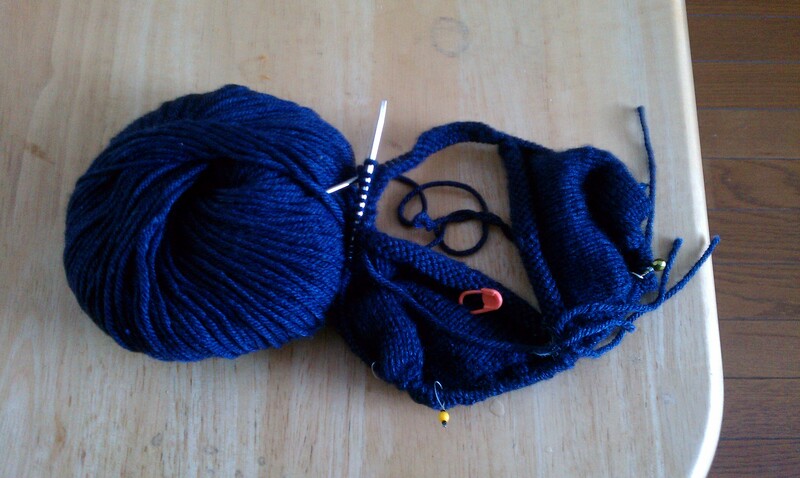 I decided on Mandel (Rav link), a simple sweater that I’ve been wanting to knit for…about two years. It’s the first saddle-shoulder construction I’ve ever made (I’m a top-down raglan kinda girl), so I’m having fun. Expect to see a sweater in about two years, at this rate. What’s an update without a blanket shot? And now, for the snowy part. 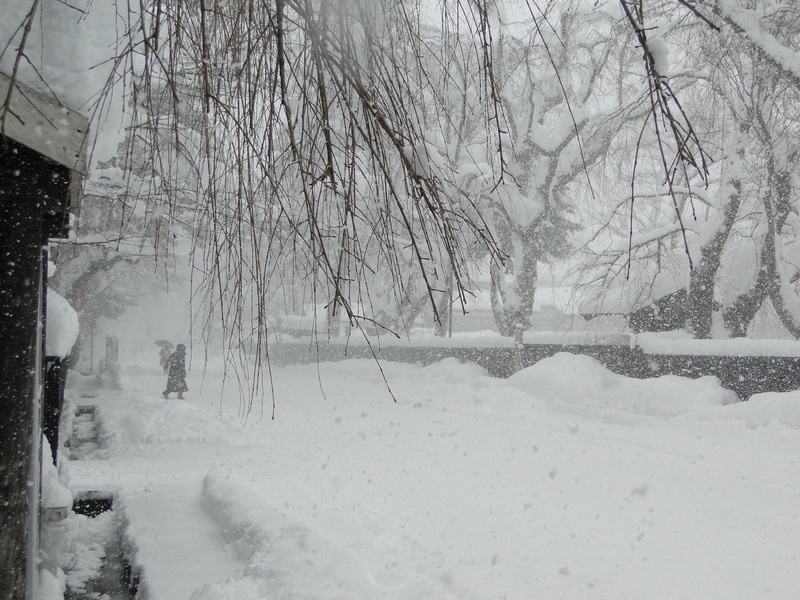 I kind of wanted to cop out of writing this post because all of my pictures are full of snow. Like, hey, check out this samurai house from the 1600s. You can kind of see it if you squint past the SNOW. 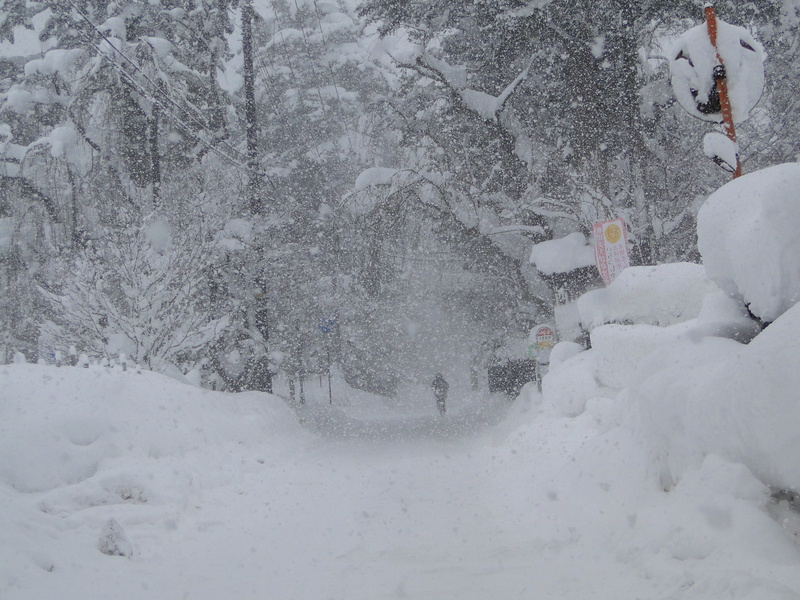 Now, as you may have picked up from my previous posts, traveling to Tohoku in winter isn’t the best way to go about things. We had fun…we could have had more fun with less snow and more fellow tourists (that’s right, I wanted to be surrounded by MORE tourists). But in the end, we saw a lot of cool things and I’d do it again, especially since Hokkaido is so close to Tohoku and with school out, we had nothing better to do. However. Kakunodate was a disappointment, especially compared to what we had hoped for. 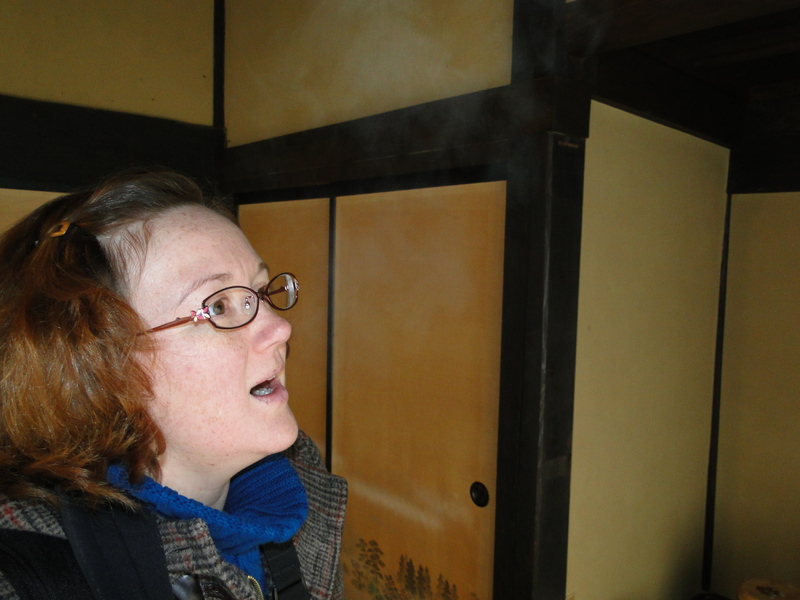 The guidebook had recommended it because it was full of old preserved samurai houses that you could poke around inside, some of them for free. This was confirmed by the map we got at the Morioka tourist information office – there were at least ten houses marked on it, all within easy walking distance of the station, most labelled as open to the public, with free admittance. 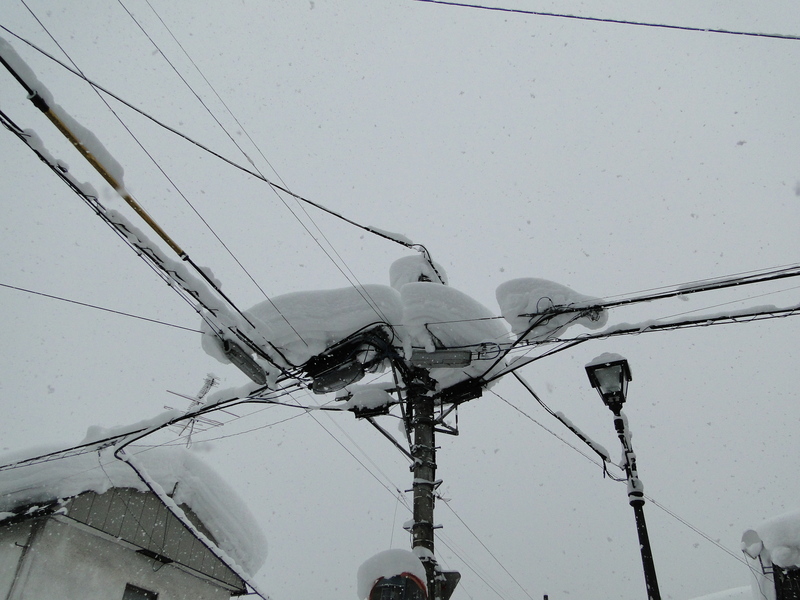 First, it snowed a lot. The scenery was beautiful, but you couldn’t look up because you’d constantly be blinking snowflakes out of your eyes. Sidewalks were covered, despite the best efforts of the townspeople (pretty much everyone we saw outside had a shovel in hand). 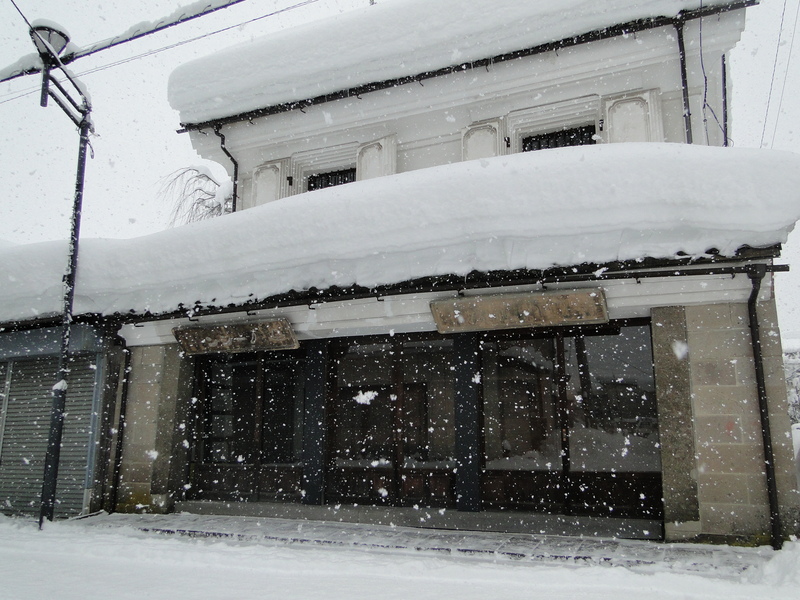 Three foot piles of snow loomed from the rooftops. 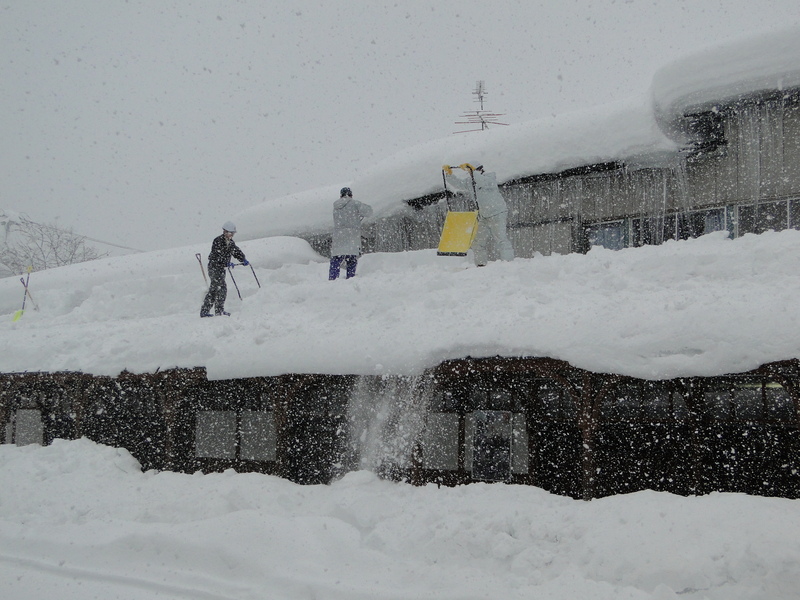 Clearing snow from the roofs before it falls and buries some unsuspecting tourist. Second, while only some of the houses on the map were indicated as only being open seasonally, in our experience, almost all of them were closed for the winter. 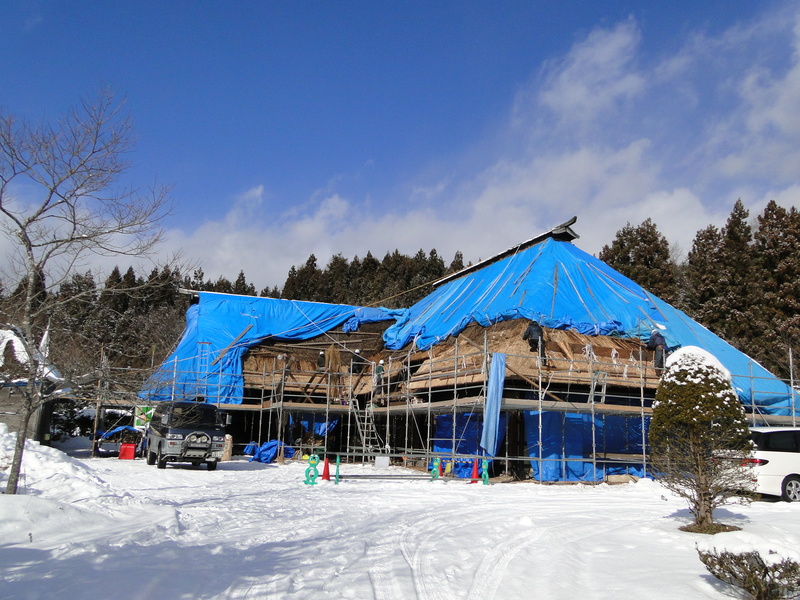 The Nishinomiya House had its storeroom open to the public, which was nice, but the main house was closed until April. Oops. 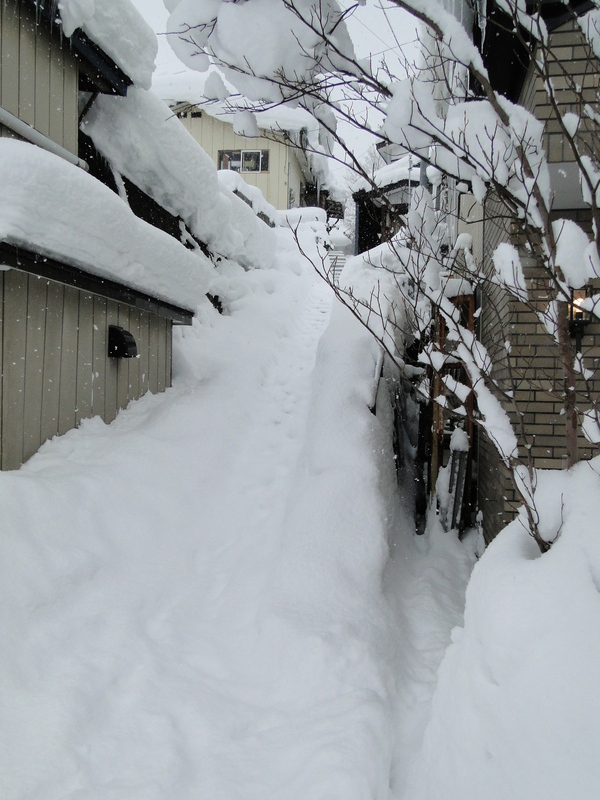 Other places had huge piles of snow in front of their front gates. One place seemed open, and had someone inside even, but they didn’t respond to our queries and we weren’t quite ready to pull a gaijin smash and go in anyway. 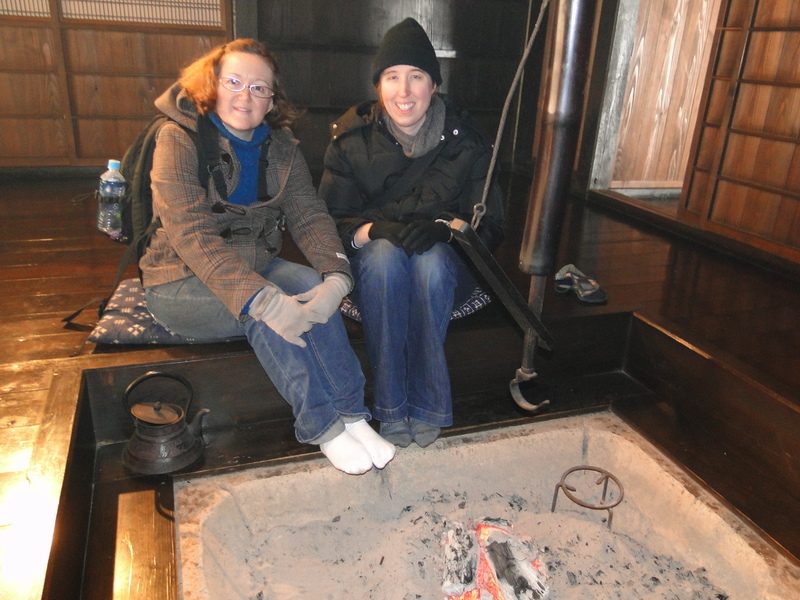 Finally, we found one place that was open – one of the fee taking places, of course, the Aoyagi Samurai Manor Museum. They had quite the set-up, however. An armory full of old weapons, with a upstairs that carried more mundane items of daily life. The outbuildings were each filled with themed exhibits, one with art by Odano Naotake, one with military uniforms and items dating back to the 1800s, one with somebody’s old music collection, and a whole building filled with Western antiques. They even had a professionally translated information pamphlet in English, so you didn’t have to do a lot of guesswork. 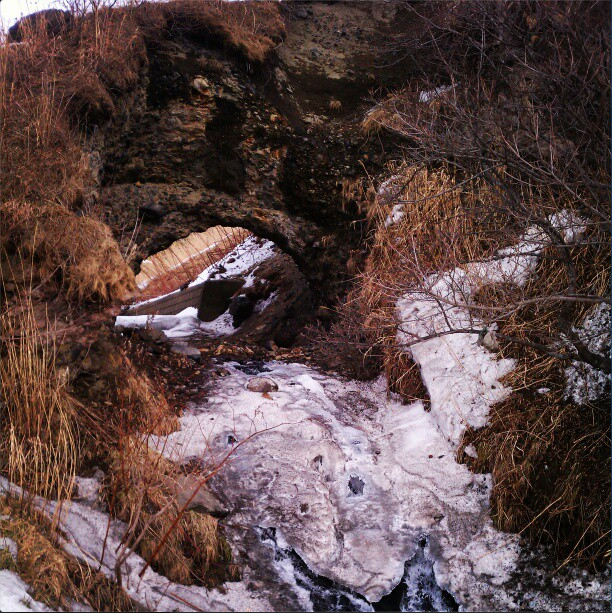 Winter struck again, however – nobody else was around and the area that was supposed to have artisans working with the local specialty, cherry bark, was empty. Alas. We considered pushing on to the Ishiguro Samurai House, since it was another fee taking house and might have had a similar museum style set-up (and been open), but by that point, we were ready to cut our losses and hunt down lunch before heading up to Aomori for the final full day of our trip. It was fun and worthwhile from an objective standpoint, I suppose. It would have been different if we’d had more accurate information. Then we could have headed directly to the fee taking houses, taken in the Denshokan museum, gone to the well stocked gift shop, and called it a great day. Instead, we stomped around cursing the map, expecting to see a bunch of cool houses and instead only seeing one. It goes slowly, but what can you say? 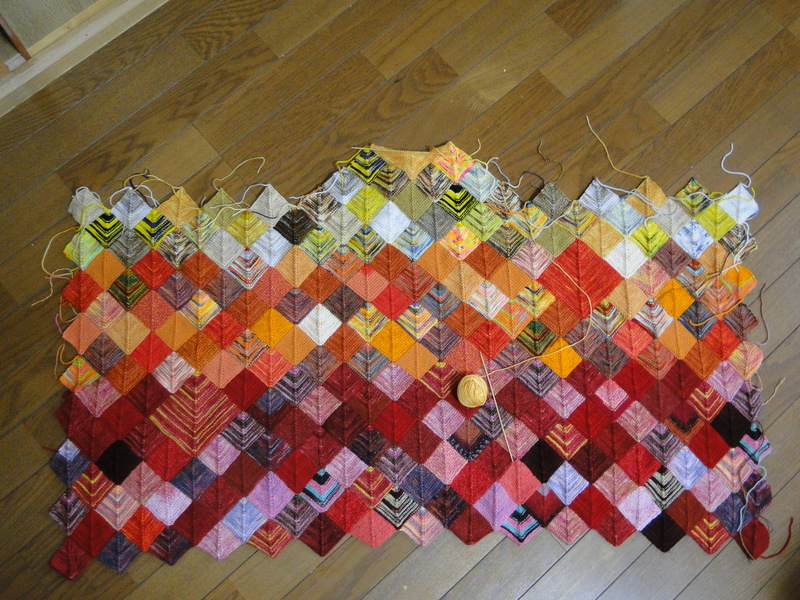 I’ve started the yellow section and fallen behind, mostly due to my trip earlier in the month. At the moment I’m only four squares behind, but to stay on track I need to knit nine squares total today. That’s like 4.5 hours of work. Not going to happen. Hopefully the weekend will bring better news. In other news, I’ve started something new that you’ll have to wait until next week to see. Oddly enough, I was inspired by this. 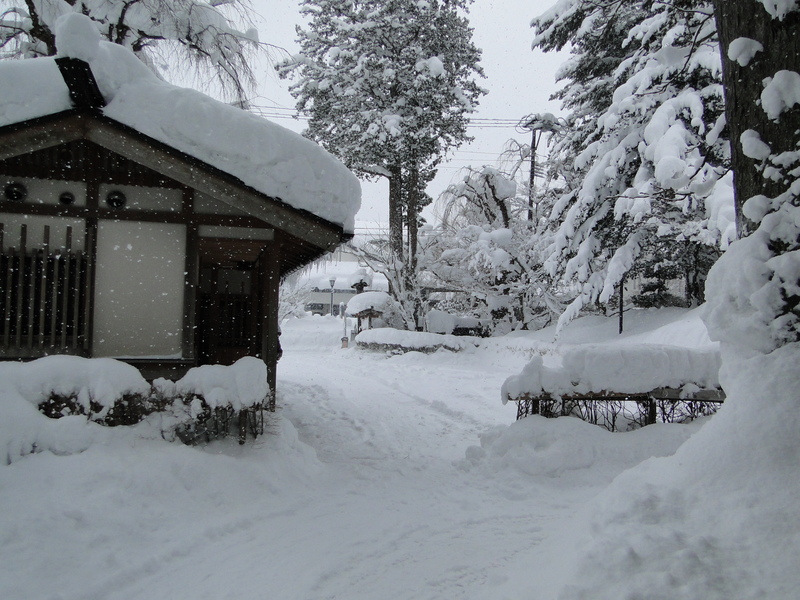 The day after we arrived in Morioka, we set off in the morning for Tono, based on two recommendations. First, from the guidebook my mother left here last May, which mentioned it as a center of traditional Japanese folklore. Second, from one of my coworkers, who had always wanted to go, partly because his family was originally from the area and partly due to the aforementioned folklore. Also because he apparently hasn’t been on a vacation since his older daughter was born (9+ years ago) and Tono is close enough that he might make it one day. 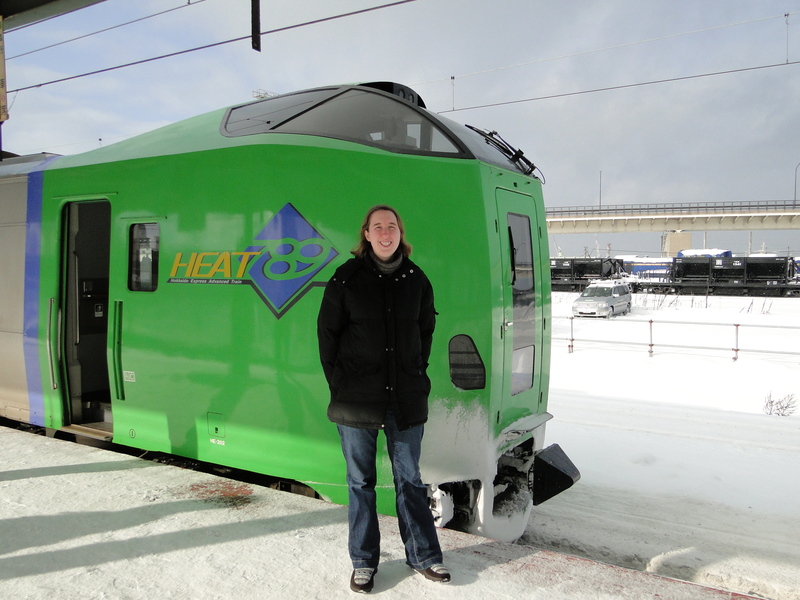 The train trip was easy enough – I meant to mention in the last post that we had purchased the Tohoku Free Pass for the trip. It was a very good deal, covering the round trip to the area in question and all train travel within Aomori, Akita, and Iwate. 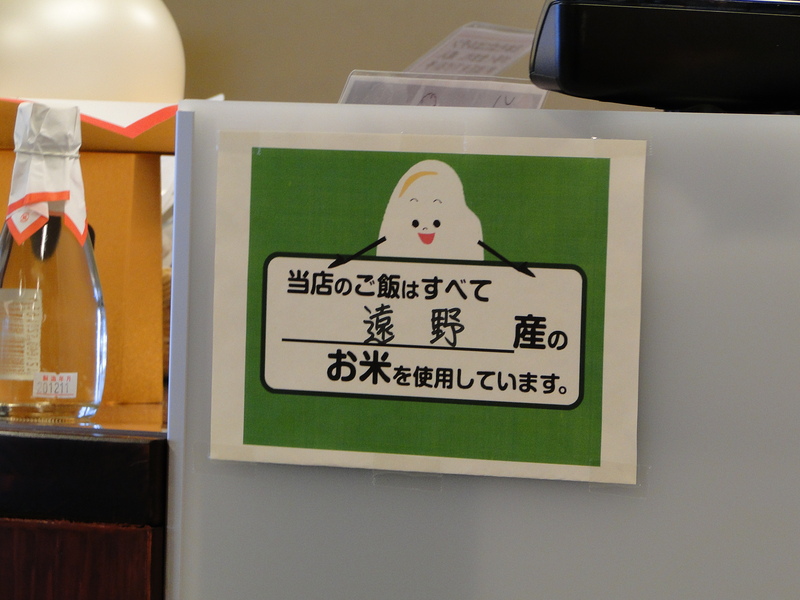 You only have to pay the shinkansen charge if you want to take the bullet train anywhere, rather than the full fare. Of course, we still managed to get into trouble – the train stopped at Hanamaki and we got off, assuming that we would need to transfer. Indeed we did – to the train we had just got off, which was switching lines and heading right for Tono. D’oh. Now I can check ‘held up a train’ off of my bingo card, thanks to the station agent who finally figured out what was going on. 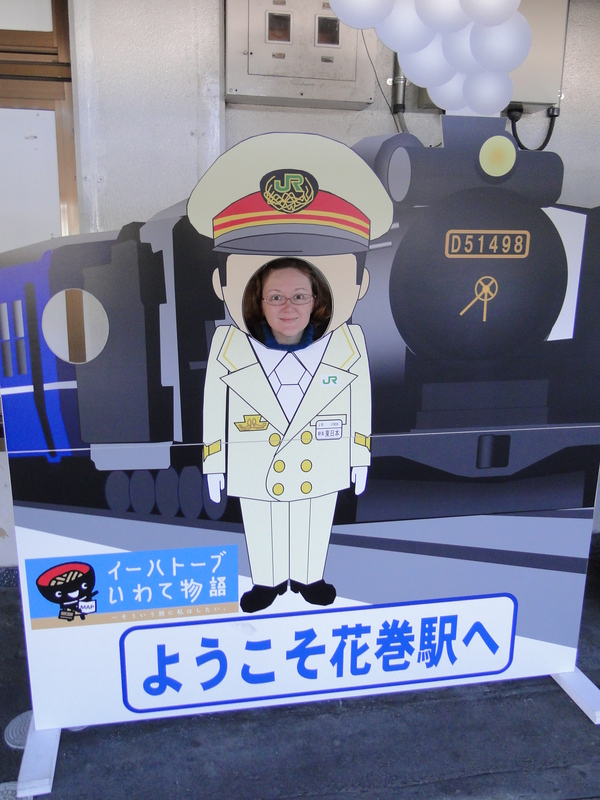 Stationmaster Carlee at Hanamaki Station. The guidebook had made a lot of noise about how one really needed a car to get around Tono, since the bus system runs infrequently. We had decided to go anyway, because 1) there appeared to be enough to do within walking distance of the station and 2) the bus system couldn’t be that bad. Right? Well, yes and no. We got lucky, arriving just before the one bus that morning that would take us to our chosen ‘out-of-town’ destination – Tono’s Furusato Village – and hopped on. I’d been to similar villages down south – a recreation of a traditional Japanese villages, with old houses, exhibits, and hands-on craft experiences, practically a Japanese Colonial Williamsburg. Just a few problems, the biggest of which was Winter, with a capital W. It wasn’t snowing, but it was freezing, and even though the village was open for business, it was obviously the off season. Nobody else was there, and the ‘knowledgeable’ staff were mostly volunteers hiding in the houses with a warm fire and a radio. Alas. They were friendly though, and happy to mention what they did know and chat about the weather. The other fail was on my head, for not reading the fine print (a theme for the two of us on this trip, as it turns out). The craft workshops were available by reservation only. Oops. 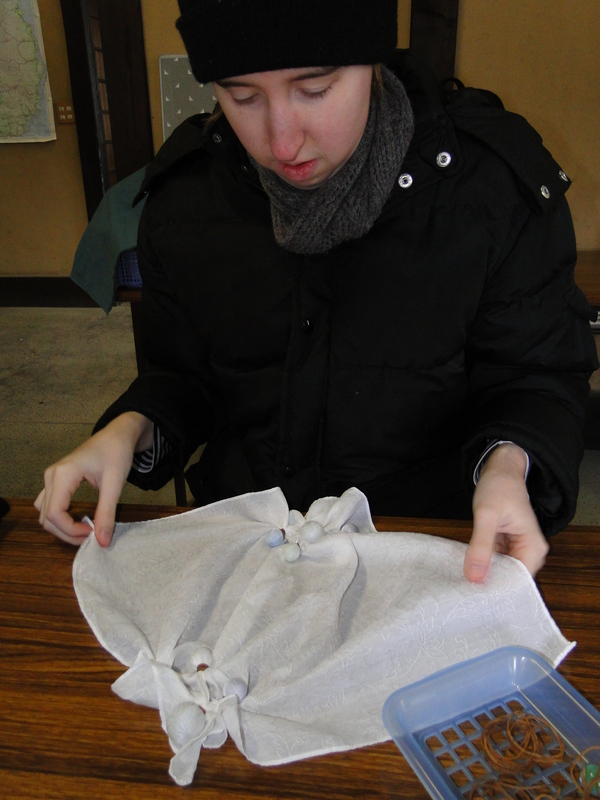 We did find a dye workshop and were able to participate in that, using marbles and rubber bands to create traditional patterns. We headed back to the main part of town in the early afternoon, freezing and crabby with hunger (‘hangry’, if you will). The folks at the tourism bureau were happy to direct us to various restaurants. The town itself did turn out to be as walkable as the map we had gotten in Morioka suggested.The Tono Municipal Museum is less than ten minutes from the station and quite cool to see. Many of the legends are in English if you don’t speak/read Japanese. There was a great multi-media wall that you could touch to watch various interactions between actors in Tono a hundred years ago. For particular interest to the Japanese language learner was the use of the local dialect between the actors. 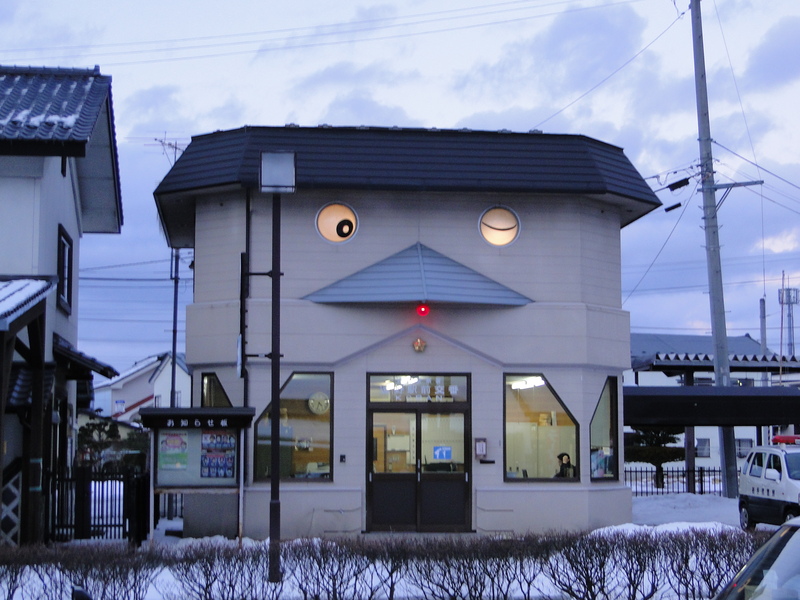 There’s a large display based on a traditional Magariya (L-shaped house), with old appliances and children’s games. You can also use a listening station to hear villagers singing traditional songs and telling tales. One of Tono’s main claims to fame is The Legends of Tono (or Tono Monogatari), a collection of tales told to a Tokyo scholar by a Tono storyteller back in 1910. The tourist bureau happened to be selling English translations, one of which I purchased. It’s an odd collection – the storyteller seems to have disgorged every odd or unusual tale he had ever heard about the area. There are creepy stories about Yama-haha, who eats a young girl and wears her skin to fool her parents (they are saved by their rooster, who has to drop some pretty heavy hints before they catch on), to more mundane ones about New Year’s traditions observed locally. Many of the tales about Yama-haha, Kappa, and Tengu were sufficiently hair-raising that I’m glad we went back to Morioka for the night. I don’t know if I could have slept in Tono! 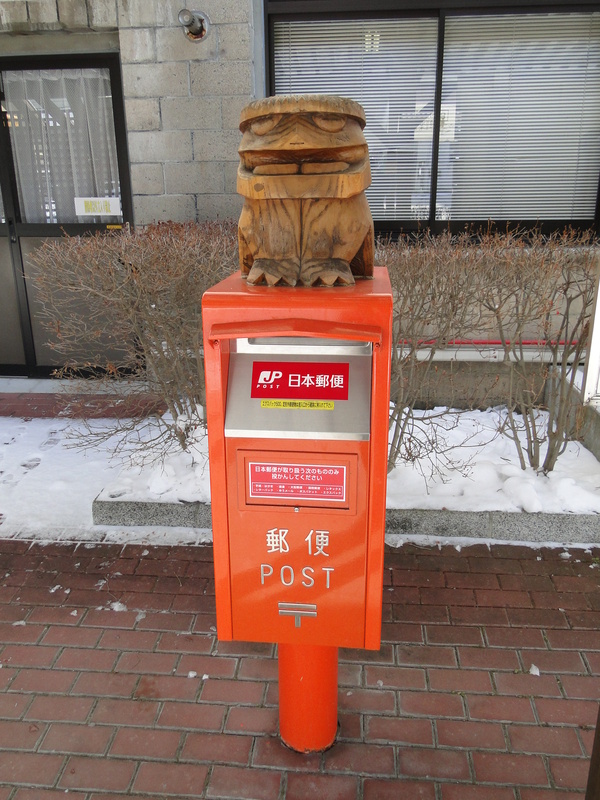 Kappa on a postbox in Tono. At Shin-Aomori, we transferred to the Tohoku shinkansen, bound for Morioka. We’d picked a destination for each day, but decided to stay in a more central location to make traveling easier. We stayed at the Toyoko Inn (there are two basically across the street from the station), which is a very good, basic chain of hotels across Japan. If you pay a one-time membership fee of 1500JPY, their rates become very reasonable indeed. Free breakfast included. 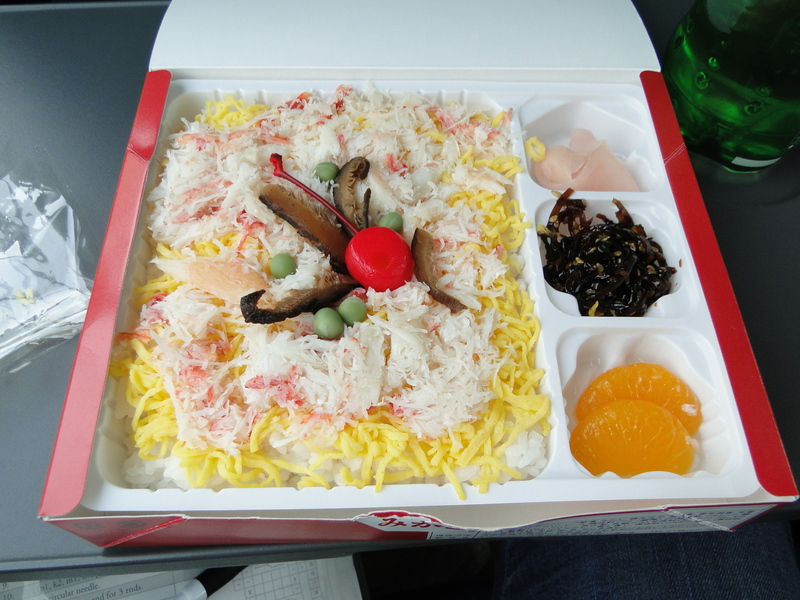 Ekiben – station specific lunchbox. This one from Hakodate had crab and hijiki (a sea veggie). More train blather – the Tohoku shinkansen has a very special quirk that might trip up the seasoned Japan traveler. On the shinkansen, you can buy a reserved seat (shiteiseki) ticket or a free seat (jiyuseki) ticket. Reserved gets you a guaranteed seat on a train at a particular time, i.e. seat 4D in car 12 on the 12:10 to Tokyo. Free is more flexible, you can take any train during a particular period bound for that destination, as long as you sit in one of the ‘free’ cars. The Tohoku shinkansen is all reserved cars, no free cars. But you can still buy a free ticket. And stand in the space between the cars. Sounds like fun, eh? Between Tokyo and Morioka, you have to stand there if you have a free ticket (and I have), north of Morioka, you can sit in any open seat…if there is one. And if the person with a ticket for that seat comes by, you have to give it up. Fun, no? Being cheap, Carlee and I ended up hopping around seats for most of the trip, then standing for the last twenty minutes. Anyway, we arrived in Morioka midday, abandoned our bags at the hotel, and set out. After perusing the brochures available at the hotel, we decided on Iwachu, an ironworks, and wanko soba for dinner (more on that later). 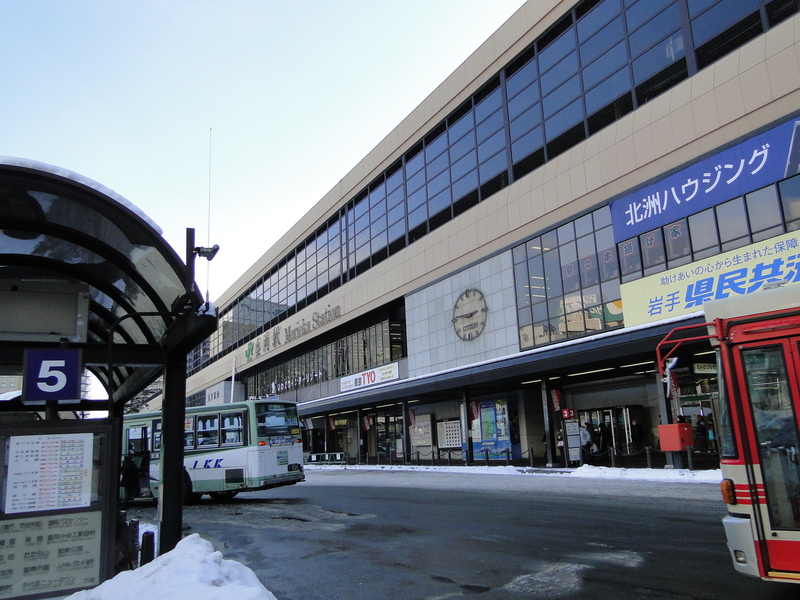 Morioka station is a transport hub for the area, with trains and a bus station right in front of the building. In the building, the information office has a very helpful staff that was willing to hand us a variety of English language maps and brochures. Also on the second floor was a tourist kiosk happy to provide directions to anywhere we wished to go in the city. They provided the bus information we needed to get to the ironworks. 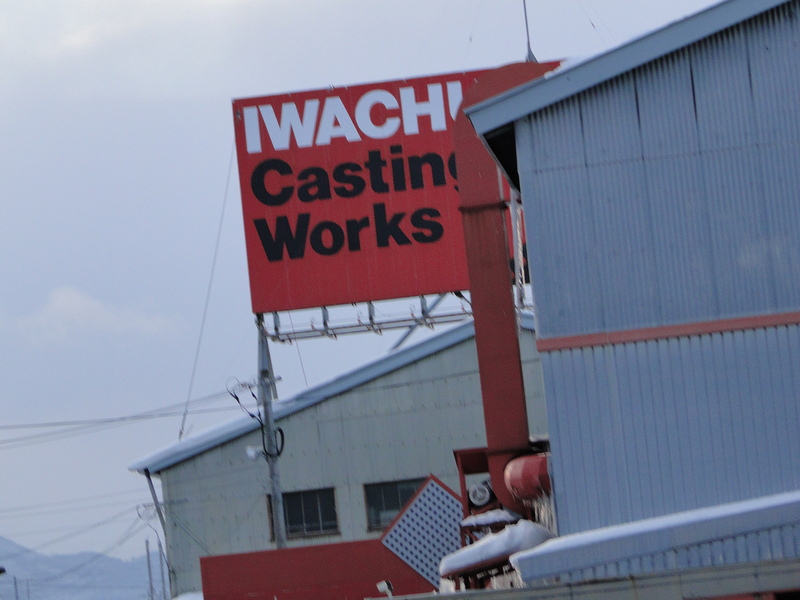 The area is famous for its iron mines and from the products created from the ore. Iwachu Casting Works was part museum, part workshop, and part gift store. The museum had examples of the more spectacular side of the workshop’s products, from a teapot big enough to bathe in to a set of iron chimes, to beautiful cut out designs mounted on the wall. Due to the sturdy nature inherent in iron, there were signs inviting patrons to touch almost anything they’d like. 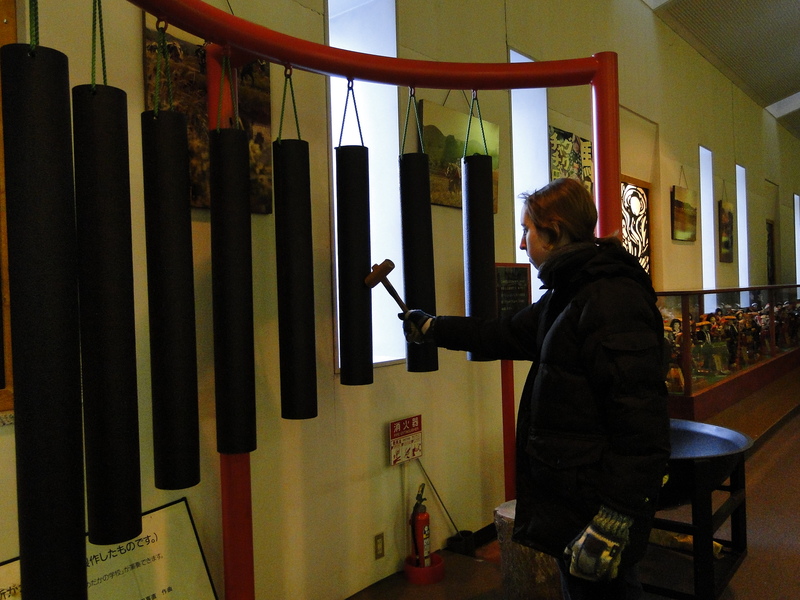 Playing with the iron bells. The workshop is open to the public, so that you can view the craftsmen at their work, creating the molds, trimming pieces, and applying lacquer. There are signs on the wall explaining the process in Japanese and English and you’re free to take pictures. The shop is wonderful, with all sorts of traditional teapots and iron cookware, along with more decorative items. The teapots range from around $50-$600 (eep), but if you’d just like something as a souvenir, there are teacups, bells, and figurines for less than $15, or even mini-teapots for less than $5. After the ironworks, we returned to the station for dinner. We’d heard of something called wanko soba from our students, along with remarks that they’d never respect us again if we went to Iwate and didn’t try it. We ended up at Azumaya, due to its proximity to the station. It turned out to be more of a production than we had anticipated. Wanko soba is an all-you-can-eat noodle set-up – with a twist. 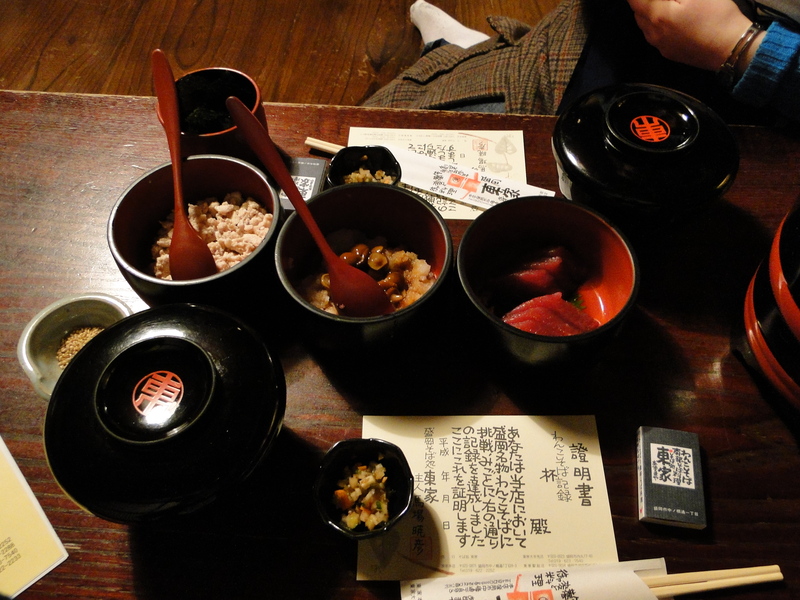 The soba is delivered by the waitress on a tray, many small bowls, each filled with just a mouthful of noodles. She dumps the mouthful into your main bowl as you eat and she won’t stop until you set the bowl down and cover it with a lid. We got the cheapest set menu, which comes with sides dishes for your soba – typical things like sliced onions, sesame seeds, and toasted nori (seaweed), but also tuna sashimi, and chicken soboro. *** This is definitely a tourist thing to do, and the staff loves to make a fuss over it. They have bibs for the customers to wear, explanation booklets to read before hand (available in English), and a certificate at the end stating how many bowls we’d managed to put away. Well, I was planning on writing about Tono as well, but I see I’ve already written a book. I’ll save that for next time. 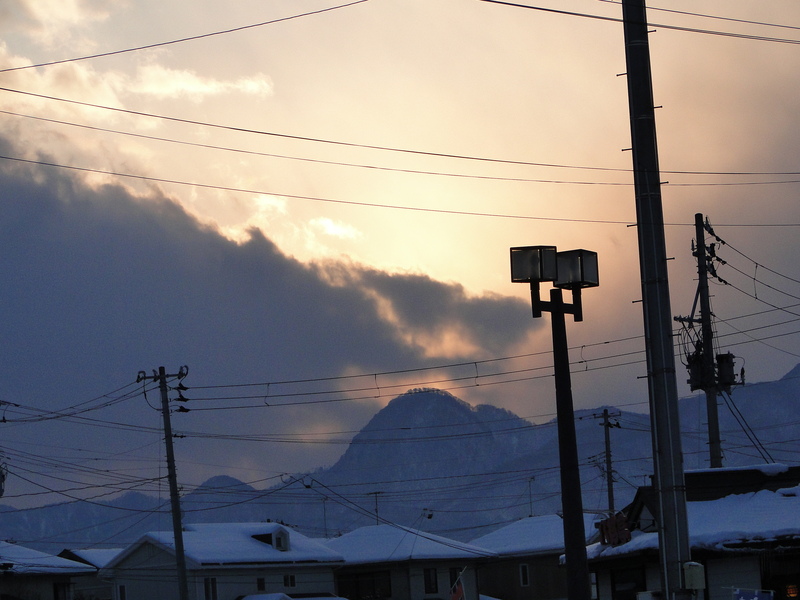 Morioka is surrounded by mountains. Finally, if you happen to be passing through Morioka station, a few recommendations right in the station. 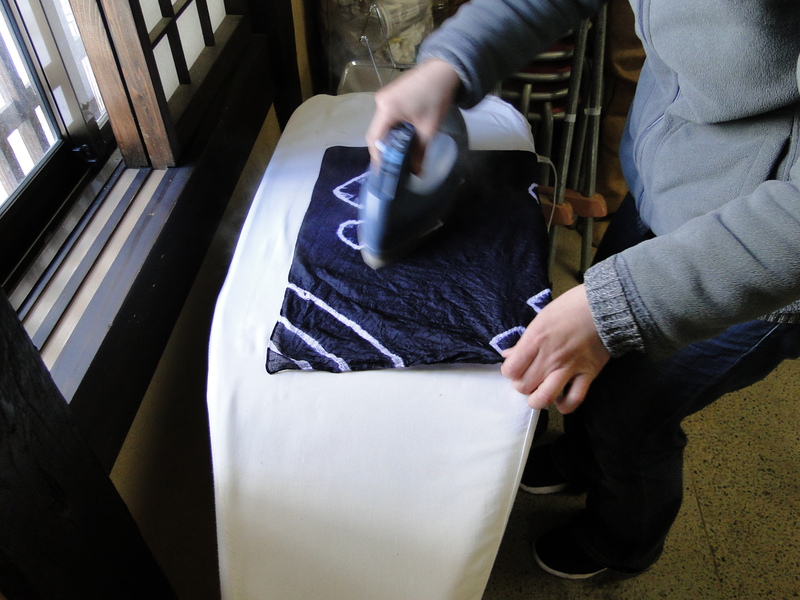 Craft Ichigoya – in the basement directly under the station, next to the Family Mart convenience store. Sells crafts by Japanese artists, with a focus on pottery, though there are also postcards and jewelry, plus some textile works. Aunt Stella – a cookie shop in the basement of the Fesan department store, which is next to the station. Right across from the McDonalds. Huge variety of cookies, available by the gram or in sets. I highly recommend the cornflake cookie. *I know I promised you a wedding entry. There have been set-backs. **This has some people grumpy, because as it turns out, the best place to put the station was further out in the sticks. 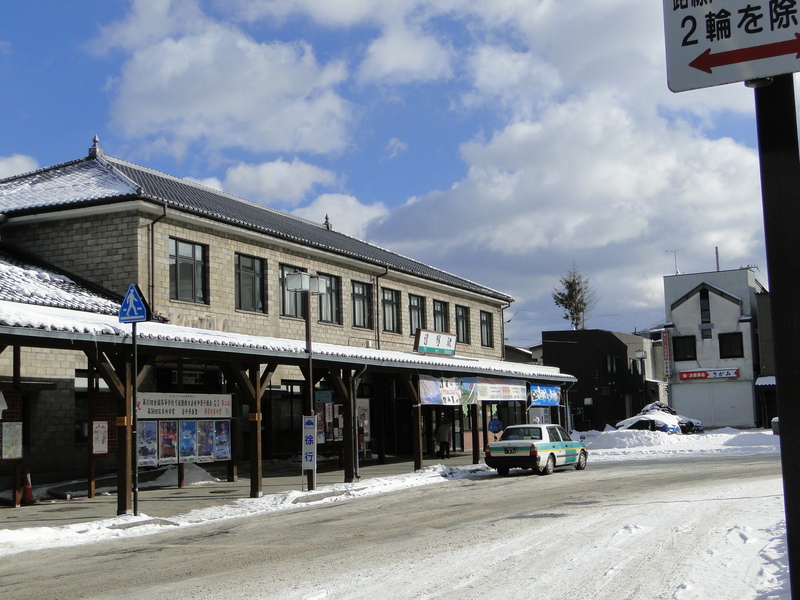 In fact, it’s not going to be in Hakodate at all, but in Hokuto City. Which wants some naming privileges. Which they’re highly unlikely to be granted. ***The chicken soboro was a revelation. I’ve had beef and pork soboro before, even made some myself, using this recipe, but never chicken. It was mild and excellent, especially with the toasted nori. Once again, I am blaming the Happy Monday System for throwing off my schedule. However, I am pleased to be sharing with you something other than the blanket. I promised a friend a hat for her birthday back in July and after going through my vast collection, she decided on this one (Rav link), in green. I had to wait until fall to buy the yarn, since the general store doesn’t stock it in summer and I don’t have any green yarn. Call it a character flaw. This is the fourth Gretel that I’ve knitted. 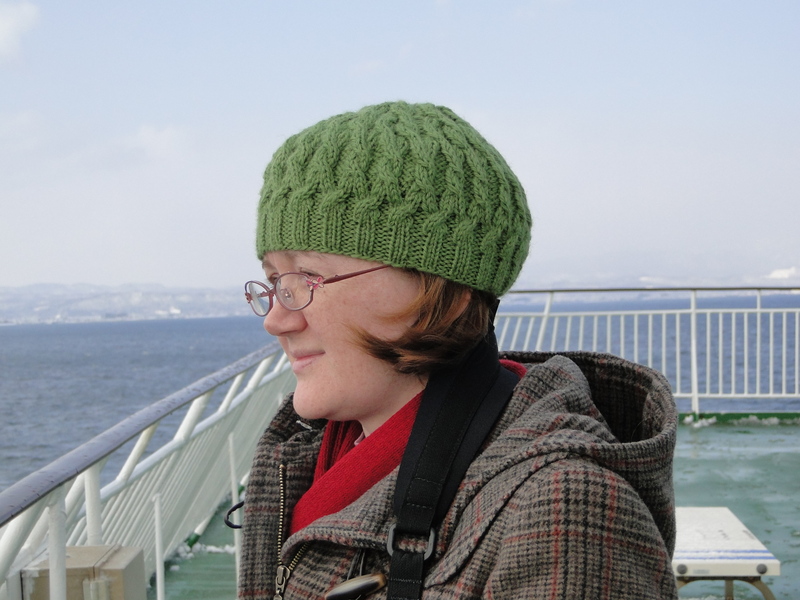 It’s a very quick pattern (this hat was completed over four days of train rides), and the finished product is popular with non-knitters. I never seem to wear the two I’ve made for myself, however, most likely due to poor yarn choices. Next week – the blanket returns! Hopefully it will look noticeably bigger to your eyes, after a two week break.